What teacher hasn’t come across that student who has a short fuse? No matter where you teach, you are always going to need to be ready for that child who needs some additional help calming down. I like to have a pro-active approach to dealing with situations such as these. One of my solutions is my CALMING CADDY. This caddy is located somewhere quiet and secluded in the classroom. When a child gets upset and needs some time to step away from their peers and calm down this is what they use. The caddy is not used as punishment but as a healthy choice to deal with emotions. The caddy is something that I present to the whole class as an option on how to deal with your feelings. I model how to use the caddy and make sure it is presented as a positive choice that all students in the class can make. 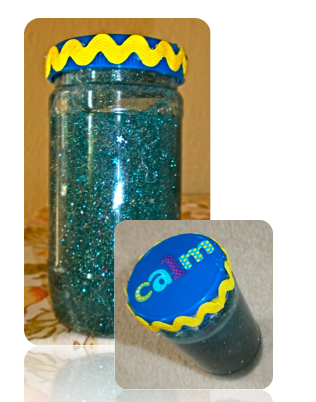 One thing I love in this caddy is the calming glitter jar..I have seen similar ideas all over pinterest so I made my own! The idea is you shake it up and watch the glitter fall. This gives the child time to breathe and be away from the situation that upset them. When the glitter settles the child can join the class again or chose to use an additional strategy from the caddy. To make this jar I used an old sunflower seed container. Many of the jars I have seen on pinterest were Mason jars...However I usually try to stay away from glass with my little ones. -Hot glue the cap on and shake! I make sure I teach the class how to use each item in the caddy appropriately to deal with their emotions. As teachers it is a great gift that we can help children learn it is ok to be mad, sad, frustrated, etc… but that learning to deal with these emotions in a healthy way is something they will take with them for years to come! If you want to download the tag I used on my caddy visit my TPT store here and download it FOR FREE!!! I have a child that has Sensory Processing Disorder and I am also a General Ed teacher. Thank you for providing this to your students! It is refreshing to see that you take a proactive and empathetic approach to the whole thing! this is the loveliest idea I've heard in a long time. You've found a way to make calming down magical, while at the same time demonstrating that it's a skill any child can (and must) learn. Brilliant! This is EXACTLY what I need for a little girl coming into my class next year - where can I find the pictures and directions that you printed off there? Thank you for sharing! I found these a long time ago and could only find this one for you! It's my favorite of them all though! Enjoy! I am a school counselor and I love this!! One request though....Would you mind sharing a copy of your Cue Cards? I don't know where to get these but would LOVE to have a copy! I have been pondering putting something of this nature with my chill chair, but I have had a few concerns. Some children carry their anger over to the chill chair and might abuse the materials. How do you prevent them from doing that? Also, students may begin to perceive the caddy as a reward for poor behavior. How do you prevent mischief makers who just want to watch the glitter fall or color instead of doing the class activity? I do believe in giving students healthy alternatives for expressing their feelings. Can you help me reconcile some of these issues before I put a calming caddy in my room? 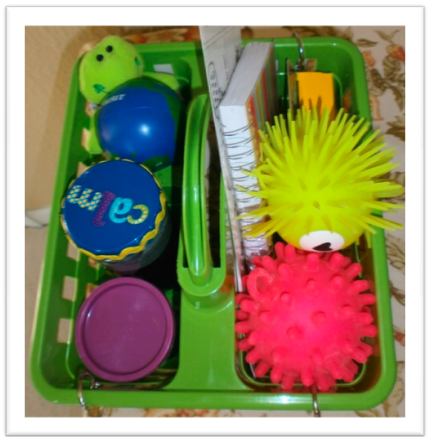 My students understand the clear expectations of how to use the materials in the calming caddy. 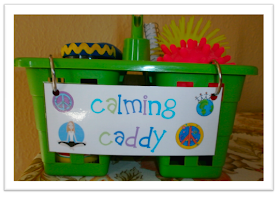 I use my own discretion if I feel like a particular student is not using the calming caddy in the correct way. If this were to happen I would have a conversation with that student about what the calming caddy is for and them watch them more closely. Hope this helps. I really have not had many of those issues. I present the caddy in a way where my students understand the importance of using it correctly by modeling correct AND incorrect reasons to use the caddy. Lots of modeling works great. Thank you! I know this is going to be just right for my kiddo in the fall! I have had a chill out bag in the past, with stress balls, playdough, rubic's cubes, and other fidgets. This year I bought a bucket because I also found back scratchers at the Target Dollar spot. I love your idea of including visuals to take deep breaths and count, etc. I'm your newest follower- found you through pinterest! Thank you! 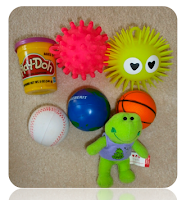 I'm not a teacher, but have been looking for ideas at home for my 2 and 3 yr old to take "calm breaks" they don't need a time out, but they need to calm down and need something else to focus on. I like the idea of giving them a variety of options. I'll be putting one together this week for them! Thank you so much for this post. I am currently working towards a dual certification in Elementary/ Special Education and love that you brought this into your classroom. 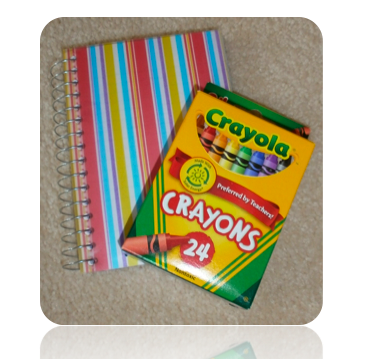 My daughter has Bipolar 1 disorder and we have had a box with similar items for her under her bed since she was 3. We also included in the box an inexpensive MP3 player that had classical music downloaded. Music is another great tool for many students. You may want to include this into your caddy next year! It works wonders! In my classroom, I have more than one student with the ADHD and bipolar disorders. If I had one of these calming caddies, all the kids would beg to play with it. They would say that it wasn't FAIR. They will ALL want the playdough. I would also have most of it stolen by the 5th day in the little secluded hiding place. It is a great idea but it is difficult for some of us to implement. Any suggestions? I have even quietly handed a student a stress ball without the others knowing it and guess what? They eventually find out and get jealous. Then the student with the ball starts to throw it or hides it in his pocket and takes it home. It worked for a day or two but then the cover is blown! What am I doing wrong? Thank you so much! I have two non verbal preschoolers, one who is officially on the Autism spectrum, and this is a fantastic resource. I actually have a child of my own at home I think this may help.